Officials are reported to have spelt the mayor’s name wrong on a watch list. Interior Minister Aryeh Deri said the mayor would now be given a letter upon his departure informing him that he was barred him from future entry to Israel. Why was the mayor banned? Israeli officials say Mr Mac Donncha, a Sinn Féin city councillor, has ties to the Dublin-based Ireland Palestine Solidarity Campaign (IPSC). Israel says the BDS movement opposes the country’s very existence and is motivated by anti-Semitism. In January, the IPSC was among 20 groups blacklisted by Israel’s strategic affairs ministry. Individuals holding senior positions in the organisation and those active in promoting the boycott would be denied entry, officials said. On Monday, Dublin City Council passed two resolutions endorsing the BDS movement and calling for the expulsion of Israel’s ambassador over the killing of Palestinians at recent protests on the Gaza-Israel border – a move Israel called “utter nonsense” and “worthy of dark dictatorships”. Mr Mac Donncha also announced that he would travel to the West Bank on Tuesday to attend a conference on the status of the city of Jerusalem at the invitation of the Palestinian Authority. 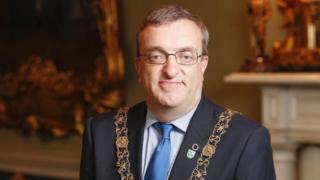 The mayor condemned US President Donald Trump’s decision to recognise Jerusalem as Israel’s capital, calling it “a backward step and a severe setback for the cause of peace, reconciliation and justice in Palestine and Israel”.